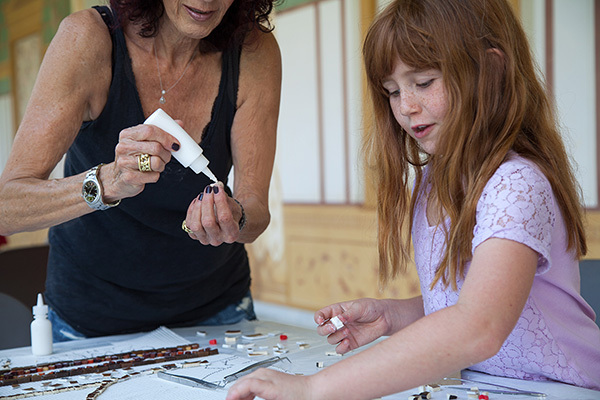 Every year thousands of Getty Villa visitors participate in family education programs designed to engage them with the Museum’s collection and exhibitions. Last summer we in the Museum’s Education Department partnered with local artist Karen Silton and St. Anthony Greek Orthodox Church to develop ArtQuest! 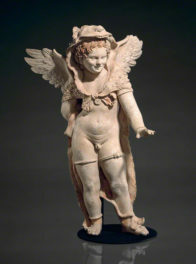 : Magnificent Mosaics, a series of drop-in family workshops to celebrate the hit exhibition Heaven and Earth: Art of Byzantium from Greek Collections. The goal of the project was to bring together Villa visitors and a local Greek Orthodox community to create a large community mosaic mural. My colleague Rebecca Edwards, education specialist for family programs, and I were faced with the task of finding a seasoned mosaicist willing to take on a collaboration of this magnitude. 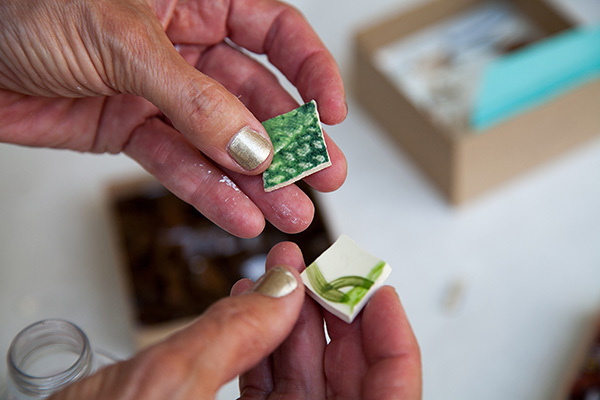 Karen Silton, a Los Angeles artist who has been teaching and creating fine art mosaics for over 20 years, stepped up to the challenge with determination and vision. 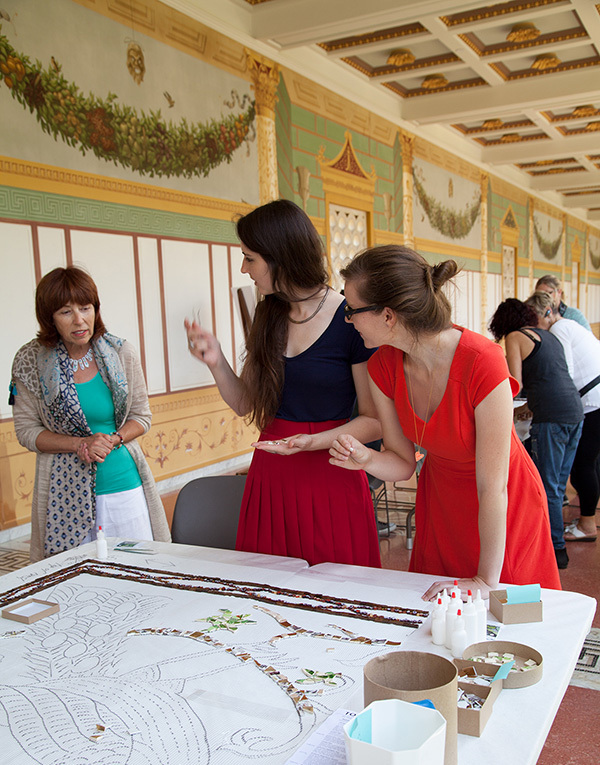 She proposed a series of workshops in which visitors could collaboratively create a mosaic mural in pique assiette, a style that requires the majority of the pieces be broken porcelain plates. The next step in the process was finding a local Greek Orthodox community to help construct this mosaic piece by piece! The Greek consulate put us in touch with the Greek School of St. Anthony Greek Orthodox Church located in Pasadena. Lead by the charismatic Fr. 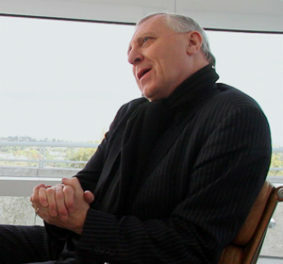 Peter Stratos, the parish opened its arms to us and welcomed the opportunity to be a part of such a collaboration. The church community leaders even offered to house the completed mural in their Trinity Ballroom, a center of church activity. 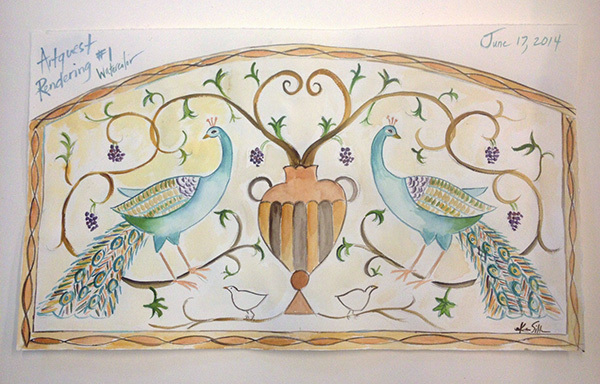 With feedback from the church and inspired by artworks in the Heaven and Earth exhibition, Karen developed a beautiful design depicting two peacocks flanking a vase overflowing with vegetation. The imagery of the birds, which alludes to eternal life, also has strong significance to the community of St. Anthony. Located a few miles from the Los Angeles County Arboretum and Botanic Garden, the church and its surrounding neighborhood are home to flocks of wild peacocks! With a home in sight and an entire community behind it, the mosaic was ready to be built. We began planning the mural workshops, step by step exploring every logistical element and considering every detail. A majority of the materials came from repurposed china—Karen’s donated and thrift-store finds. These all needed to be precut into small enough pieces. To complement the broken china pieces, Italian smalti, millefioris handmade porcelain, and fused glass pieces were also included. Over the course of six days, over 1,000 visitors to the drop-in workshop constructed the mosaic in segments by adhering small pieces of prepared porcelain on to mesh sections. 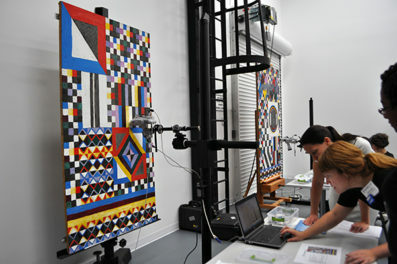 Once the majority of the mosaic was completed, Karen finalized the mosaic off site. 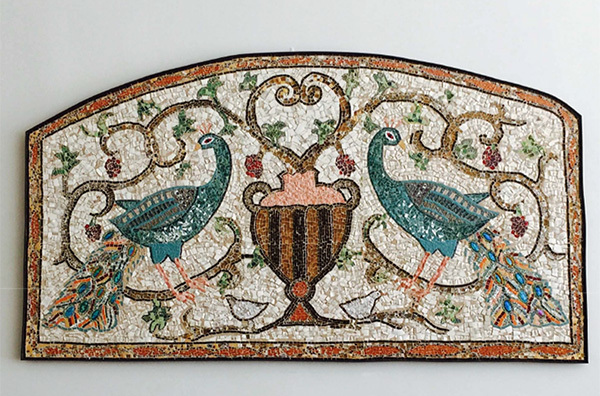 She joined the large segments together and completed the mosaic by grouting it—a complex and labor-intensive task. With the masterpiece completed and ready for installation, the Getty donated the completed mosaic to St. Anthony’s, which proudly unveiled the artwork at its 60th anniversary gala. To a crowd of over 300 church members, St. Anthony’s president Ted Attalla and vice president John Vidalakis spoke enthusiastically of the collaboration between the church, Karen Silton, and the Getty. Surrounded by crowds of eager admirers, Karen spoke about the final steps in the completion of the mosaic and of the meaning behind her design. 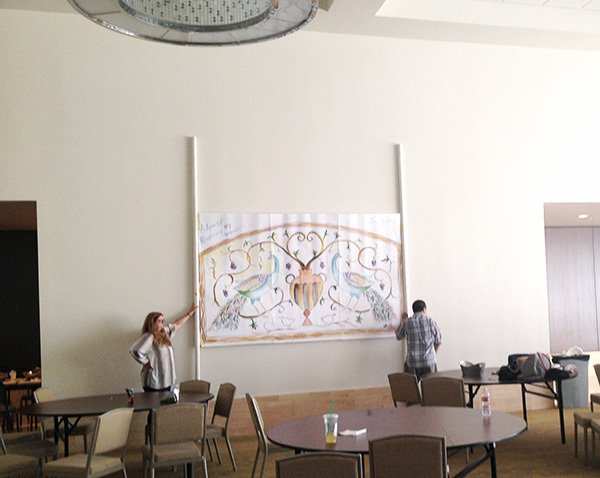 Today the artwork is elegantly hung in the Trinity Ballroom and can be seen during regular church hours.